Here I am again, submitting for your consideration various short story snacks, ranging from a quick "lunch break" read to "devour in an afternoon." I hope you get a chance to try some of them out! Talented toy-maker, Grace York, is focused on her career, but she daydreams about a slower-paced era, filled with ballet and fancy dresses. 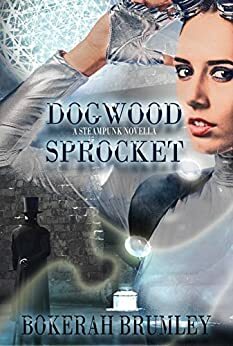 When bearded inventor, Hugh Hawthorne, sticks his head through a point-to-point portal and into her life, Grace York is sucked into Hugh’s 1887 alternate reality with no hope of return. Struggling to settle into her new steam-powered world, Grace discovers Hugh is keeping a secret that will aid in her return to 2287. Will Hugh convince Grace that two time travelers can build a future… together? This one is hard to discuss without spoilers, but I'm going to do my best to be vague. I really enjoyed the writing style, characterization, and word building. The romance built naturally with a little bit of immediate attraction held at bay by just the right tension, and I liked the (somewhat spoilery thing) that caused the hang up between Hugh getting to open up to Grace and how that worked out. My slight issue is it took so much time with the build up (which was really well done) that it led to the end feeling a little bit rushed. The conclusion was satisfying, but there was a point where "something goes wrong" (being vague) and I wasn't really given time to process it before it led to some major choices on the part of the character but then it was fixed again maybe a little too quickly/easily. I think if the end of the story had gone more at the pace of the first three-quarters or so (given us a little bit of time to process things) I would've enjoyed the end better. It sort of makes up for this by having a satisfying "epilogue" at the end to show how everything settled out, though, so I was left feeling cheated. There was just a moment of "well that escalated quickly" that didn't quite resonate with me. I'd still recommend this, though. The writing and characterization make up for that "plot bump." Jennie Walden is a young woman who has written papers for natural science journals, and has corresponded with a fellow naturalist, Oliver Gunnersen, for years. When Oliver proposes long distance, Jennie travels to Oliver's home at Bramblewood Estate to wed her mysterious friend. She is astonished at his size and physical strength, yet his adorable shyness remains, if she can see past his imposing exterior. 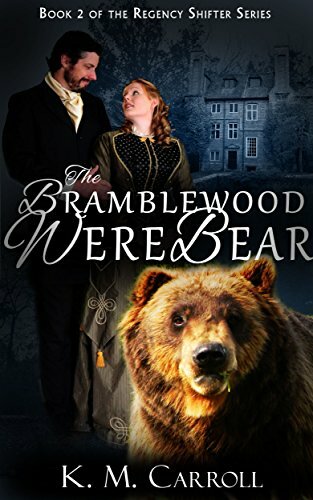 Oliver has kept his bear form secret from Jennie, fearful that if she knew that he was a monster, she would flee. But the werewolves of the neighboring city of Grayton have emerged to mingle with the populace. A certain pack has begun threatening him and the treasure he protects on the Bramblewood land. The werewolves know that he cannot tolerate another shifter in his territory ... and threaten to turn Jennie. Now Jennie must choose whether to flee, or whether to stick with this bear-man she has grown to love from a distance. The time is coming when their very survival depends on the love of the other. This is a mash up book. I don't want to compare it to Pride and Prejudice and Zombies, because it's NOT that, but the idea of taking two incongruous things and smashing them together into something fun ... that's what I mean. For one thing, with shifter romance, I think people expect high heat levels and bodice ripping ... this isn't that at all. It's a "regency" romance and doesn't get much beyond a little bit of kissing. Everyone is very proper and respectful which is a great contrast to when (various characters, no spoilers) turn into the were-versions of themselves and start rending and tearing and basically making a mess of things. My one sort of complaint is, for a novella, this has a lot going on. A lot of subplots, a lot of world building to keep track of. I wouldn't say it felt rushed, but there were some points that it felt a little like a speedbump ... I think the people more in it for a detailed fantasy will love that part, but I kind of was in a "fun romp" sort of mood when I read this, and it satisfied that itch, but I may have skimmed a few paragraphs about the economic issues of the wolf people to get to bears bashing in heads then swearing eternal love parts.